President Donald Trump says the French president’s decision to delay an energy tax hike after massive protests justifies his own decision to withdraw from an international climate accord. Trump says he wants clean air and water, but U.S. taxpayers and workers “shouldn’t pay to clean up other countries’ pollution.” He has said the accord would damage the U.S. economy. France’s planned tax hike was aimed at weaning French consumers off fossil fuels, which are believed to contribute to climate change. A commander of the International Space Station says he has seen the impact of climate change on Earth and hopes nations can work together to tackle it. The German geophysicist and astronaut said he was struck by how brown and dried out Europe looked this summer, which saw extended heat and little rain across much of the continent. Gerst added he hoped negotiators gathered in Poland would be inspired by the same “spirit of collaboration” that exists on the space station. Scotland’s First Minister Nicola Sturgeon says her government is determined to reduce emissions to net zero “as quickly as possible” — and staying within the European Union would help. Speaking on the sidelines of the U.N. climate summit in Poland on Tuesday, she noted that the oil and gas sector is a major employer in Scotland. She backed the idea of a “just transition” for workers and those dependent on cheap fuel, saying without it the effort to curb greenhouse gases will run into more resistance. Scotland has started the legislative process to achieve carbon neutrality by mid-century. Asked about a European Union proposal to go a step further by having net zero emissions of all greenhouse gases by 2050, Sturgeon said she hoped Scotland would continue to be part of the bloc then. Sturgeon opposes Britain’s planned exit from the EU next year. Poland’s prime minister says the country, which has some of Europe’s most polluted cities, will invest between 3-4 billion euros ($3.4-$ 4.5 billion) in low-emissions public transport. Mateusz Morawiecki said Poland is seeking to buy 1,077 electric buses. His announcement came during a U.N. climate conference taking place in the southern Polish city of Katowice, which is at the heart of the country’s coal mining region. Slovakia’s prosecutor general has ruled that 12 Greenpeace activists who were kept in detention after protesting against a lignite mining company should be immediately released. A county court in Prievidza ruled on Sunday that the activists would have to remain in custody until they are put on trial, saying they might continue illegal activity if released. But prosecutor Jaromir Ciznar says their detention was not justified. The activists from Slovakia, the Czech Republic, Finland, Germany and Belgium were arrested for displaying anti-coal mining banners on a mining tower in Novaky. They were detained as negotiators from around the world assembled in neighboring Poland for two weeks of talks on curbing climate change. Greenpeace called their detention unacceptable. Miners are celebrating their patron saint in the southern Polish city that’s hosting U.N. climate talks. Musicians began the “Barboka” Miners Day, dedicated to Catholic Saint Barbara, with a traditional sunrise concert Tuesday in the streets of Katowice. The procession later moves to church for a Mass in honor of the patron saint. Katowice has been a center of coal mining for more than a century. Scientists say the use of coal, one of the most polluting fossil fuels, needs to be radically reduced by the middle of the century to curb global warming. Five international banks are pledging to use the billions at their disposal to steer clients away from businesses that emit large amounts of greenhouse gases. The banks, led by ING of the Netherlands, announced the plan Tuesday on the sidelines of the U.N. climate summit in Poland. The Katowice Commitment, named after the city hosting the two-week summit, is also backed by BBVA, Standard Chartered, BNP Paribas and Societe Generale. The banks, with a combined loan book of over 2.4 trillion euros ($2.72 trillion), say they want to support the Paris accord on curbing climate change. Measures include developing tools to ensure lending is aligned with emissions-reduction goals and financing low-emissions technologies. 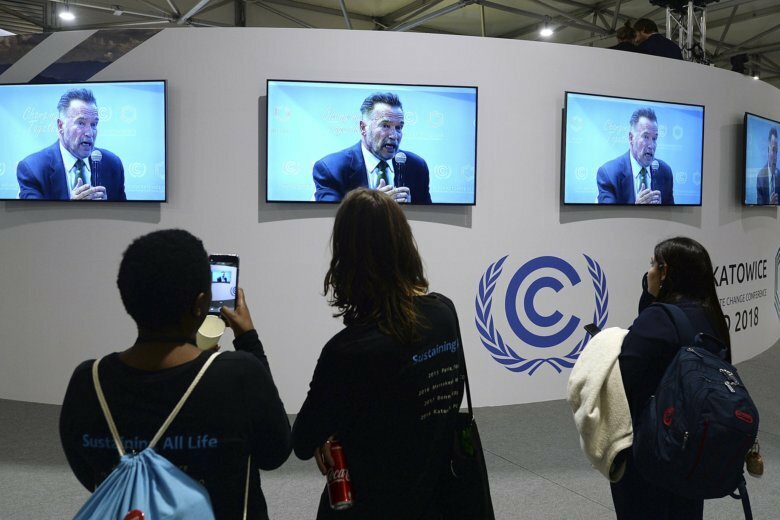 Negotiators gathered for the U.N. climate talks in Poland are getting down to the nitty-gritty part of the two-week meeting. Diplomats from almost 200 countries began holding a series of technical talks Tuesday aimed at finalizing the rules that define the 2015 Paris accord on curbing global warming. Decisions on crunch issues are expected to be left to ministers when they return to the southern Polish city of Katowice next week. U.N. Secretary-General Antonio Guterres made a dramatic appeal to governments Monday to confront the threat of unchecked climate change. Scientists say manmade emissions of greenhouses gases must be reduced to net zero by 2050 to stop catastrophic warming this century.